Need a great gift? You've found it. There are actually six, yes 6. patterns included with this. There is a very stylish wristlet that is the perfect size for many uses. Inside the wristlet is an attached zippered pocket/coin purse, a bill pocket, and an attached ID pocket that can be flipped out for viewing. 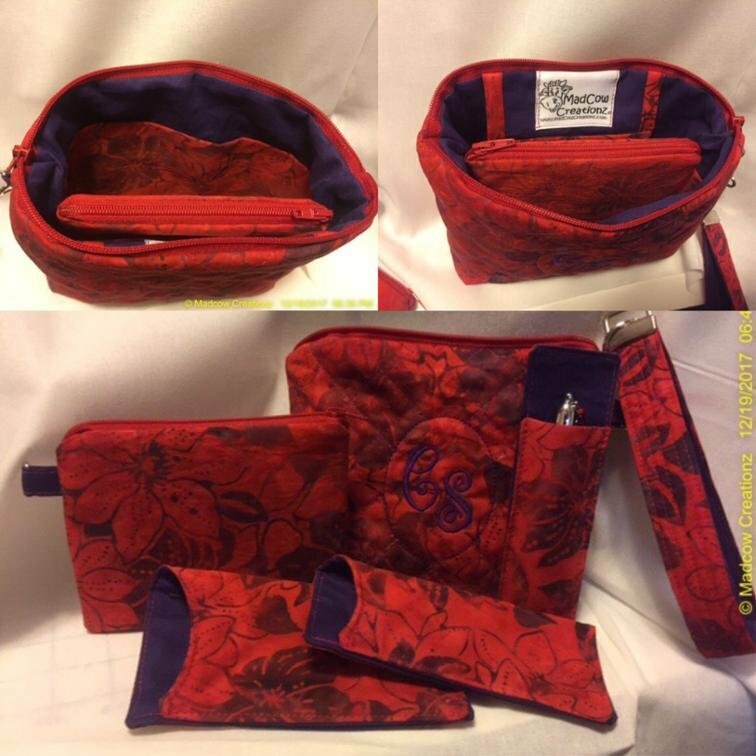 There is also a sunglasses case, a reading glasses case, a pen holder and and external coin purse. The external coin purse can also be used with the included Key Fob/Strap that is attached to the wristlet. Personalization can be added to any of the items if desired. MadCow Creationz was created from a group of four sets of Mothers and Daughters who love to sew together. Mothers And Daughters Crafting On Weekends was where the MadCow name came from. We sew, we quilt, we laugh, we eat, we have a good time and we are all very creative. From that group, creativity bloomed and a company was born. My name is Martha Sheriff. I have sewn for as long as I can remember, first with those sewing cards. (Anybody remember those?) And I watched my mother sew all my and my sister’s clothes. She was an amazing seamstress and artist. I didn’t have a store bought dress until I was 12. I hated it. I started making my own clothes in Jr. High. My mother always thought that anybody could sew if they could read, that is until I started sewing. She always told me I’d learn more from my mistakes that from my successes. I always told her that I must be a pretty smart gal then.